Google refreshed its YouTube Android app today with update v5.0.21, enabling in-app multitasking, playlist searches and expanded Chromecast support. Multitasking is particularly helpful. It allows users to minimize videos by flicking the screen in a downward motion, putting the still playing YouTube video in the bottom right corner. With the video out of the way, users can reach all of the menus within the app without having to close what they're watching. Previously, the search menu partially covered up the running video and closed what was playing as soon as you selected the search term. Returning the video to its normal full-screen state is just as simple. It requires making the opposite gesture - flicking the video up - from the bottom right corner. Sliding the video to the left closes it. In-app multitasking is incredibly slick in the new YouTube Android update, and what you can do in the app is now more accessible. Public playlists can be searched as an option next to sifting through videos and channels. Accessing your own playlists, history, favorites, uploads and watch later queue is also easier thanks to a slideout menu common among other apps like Google+ and Facebook. Finally, thumbs up, thumbs down and the flag buttons are below all videos instead of hidden within an annoying downward arrow. Channel owners seeking more thumbs up votes and users looking to rate videos should appreciate this. Google hasn't beefed up its very limited Chromecast app support just yet, but the company is improving the way YouTube on Android interacts with the media streaming device. When extending the YouTube app to Chromecast, selecting a new video will bring about a floating menu with options to play it immediately or add the video to the TV queue. This Google Now-like card user interface also contains relevant information about the video including a photo, the channel name, how many views it has so far, likes and dislikes, and the description. When can you download update v5.0.21? 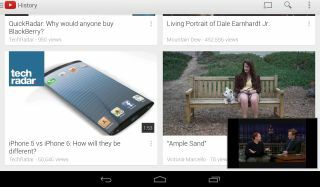 Google hasn't pushed its latest YouTube app update out to all Android devices, but the APK has made its rounds for those who can't wait thanks to Android Police. Even though it isn't fully available in the Google Play store just yet, we can confirm that it works on the new Nexus 7 flawlessly, taking full advantage of the tablet's 7-inch screen and 2.3 million pixels. We asked Google when we can expect an iOS update with similar functions and we will update this story when we hear back.